iDesign - National TalentS Co.
King Abdulaziz Center for World Culture launched iThra Award for Creative Design which provided a chance for youth to participate in applying the center’s identity through a contest in creative designs. 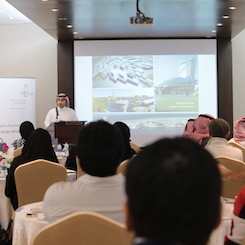 The Contest was launched through a launching event with the presence of Kingdom’s most famous and influential people in multiple areas of knowledge, spreading the word about the contest, this event was followed by meetings in Jeddah and Riyadh for participants to know more about the contest. 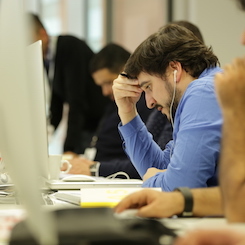 80 Participants (individuals and teams) applied to the competition. 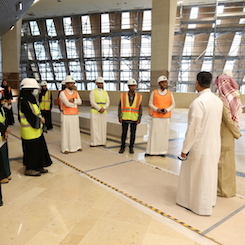 12 best participants (individuals and teams) were selected for primary judging and interviews, top 5 teams were selected. 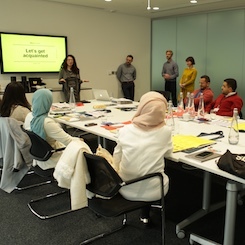 The top 5 teams went on a rich mentorship program in London UK with Siegel+Gale, world-leading design and branding agency, then, were invited on a tour in KACWC. After a rigorous selection and mentorship process, contestants were celebrated for there marvelous designs in a final event that will mark the finish line by selecting the winning design which will be applied to the center’s identity. 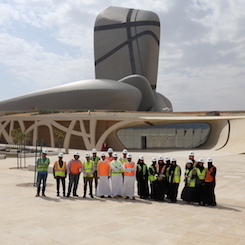 Client: King Abdulaziz Center for World Culture .